Discover Southridge is a one-hour, interactive event where the location pastors answer the question, “So what is Southridge all about?” It’s an opportunity to learn about the Southridge story, what we believe is God’s vision for out church, the programs we deliver, the lifestyle we promote, and what your involvement could look like. Come out to “Discover Southridge” to learn about who we are, why we do what we do, and how you can get involved in this awesome adventure. Whether it’s your first time here or you’ve been around for a while, we would love to answer your questions and help you figure out your next steps. 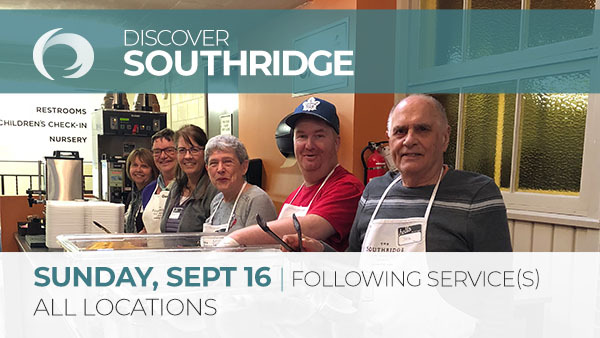 Discover Southridge will take place at all locations on Sunday, September 16 after all services in each locations’ Connection Lounge.